After spending a week in Whistler Village my husband and I were excited to head into the wilderness for a few nights. We had spent the last few days soaked by the pouring rains during our vacation in Whistler, but had made the best of the situation enjoying mountain biking, hiking and running. 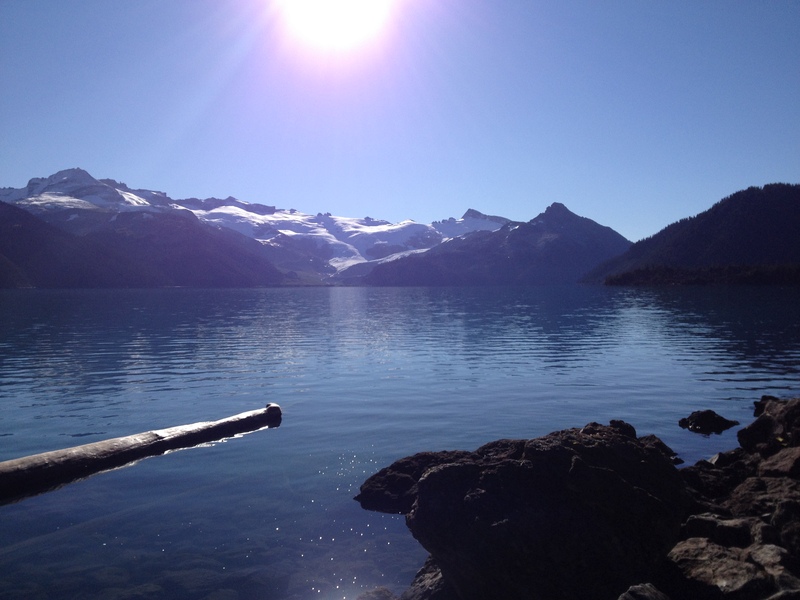 Although the weather forecast was showing one final day of rain for our hike into Garibaldi Provincial Park, the remaining days looked promising with sunshine and mild temperatures. All we had to do was make it through one hike in the rain, and the rest of the days would be high and dry. After unloading all of our luggage and bikes into a local storage unit for the next few days, we arrived at the Rubble Creek trailhead around noon. The parking lot was half full and only a few other backpackers were preparing for their journey into the wet wilderness. 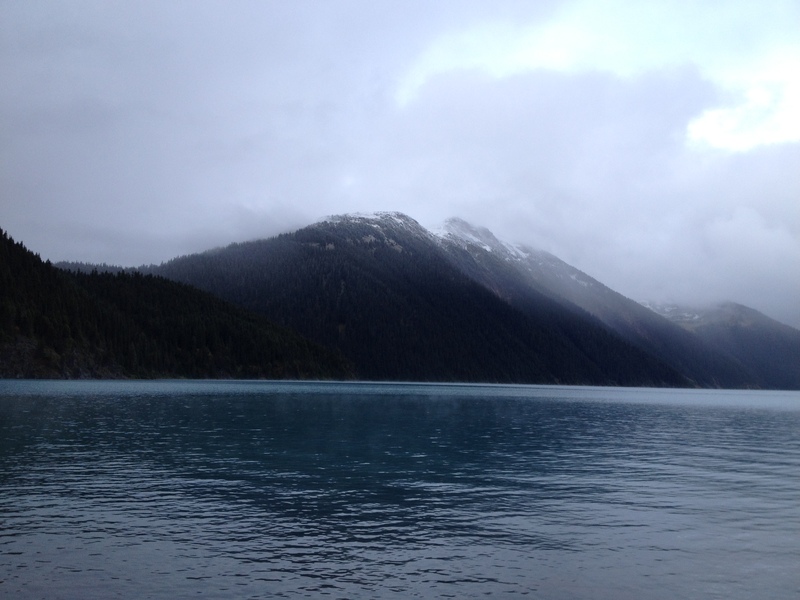 We sat in the car looking over the map and eating our lunch mentally preparing ourselves for the climb up to Garibaldi Lake in the cold, pouring rain. The two of us had procrastinated enough, and it was time to hit the trail. 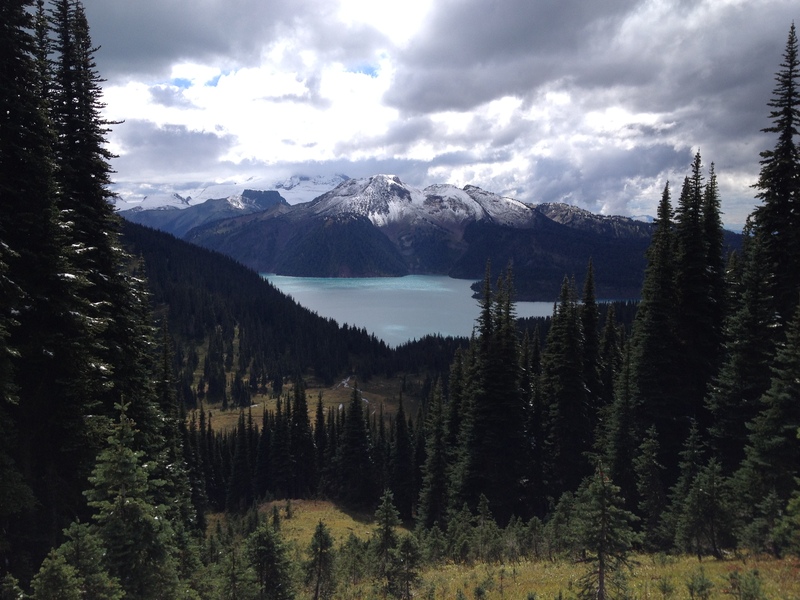 With our bodies and packs protected with wet weather gear, we started our journey upwards towards Garibaldi Lake. The trail instantly starts to climb upwards and never stops climbing! It wasn’t long before our hearts were racing and our bodies were warmed. This is where I made my first mistake. Living in the Pacific Northwest, I am very comfortable hiking in the rain. 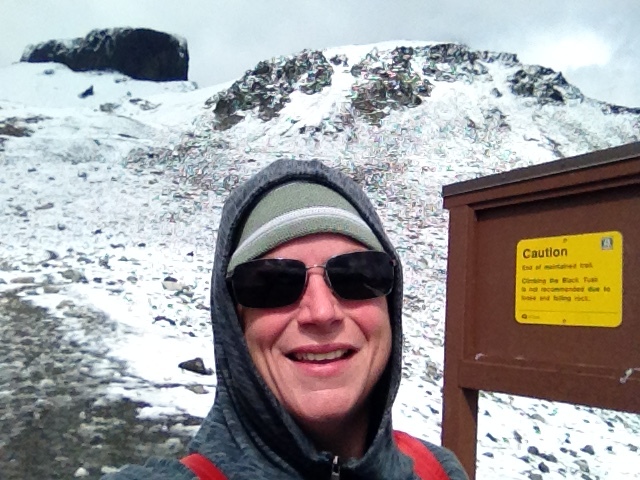 I was happy to shed my layers and let the rain cool me off as I trekked along. As the rain slowed and eventually stopped, my gear was drying up and things were looking up. It was a nice hike and we were practically alone the entire way. It wasn’t long before the rain came back, and began to soak everything once again. I knew we were closing in on Garibaldi Lake, so I mistakenly opted to continue to hike without the protection of my rain gear. 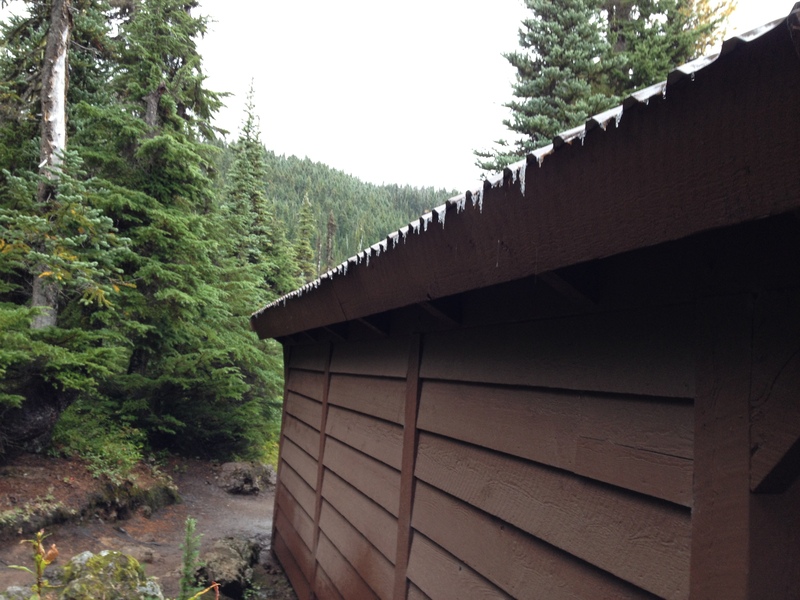 By the time we arrived at the backpackers campground, we were soaked. Because I had chosen to hike without the protection of my wet weather gear, my clothes and hair were drenched. We were happy to learn that shelters were provided for cooking and storing food, allowing us a dry location to rest before setting up camp. As we laid our clothes and gear out to dry we enjoyed friendly conversation with a fellow backpacker and her two children. We waited out the rain while we warmed our bodies with hot tea and cocoa. The clouds parted just long enough for us to pick out a site and set up our tent. It wasn’t long before the rain returned so we rushed back to the warmth of the dry shelter to cook dinner in hopes that the rain would dissipate once and for all as forecasted. 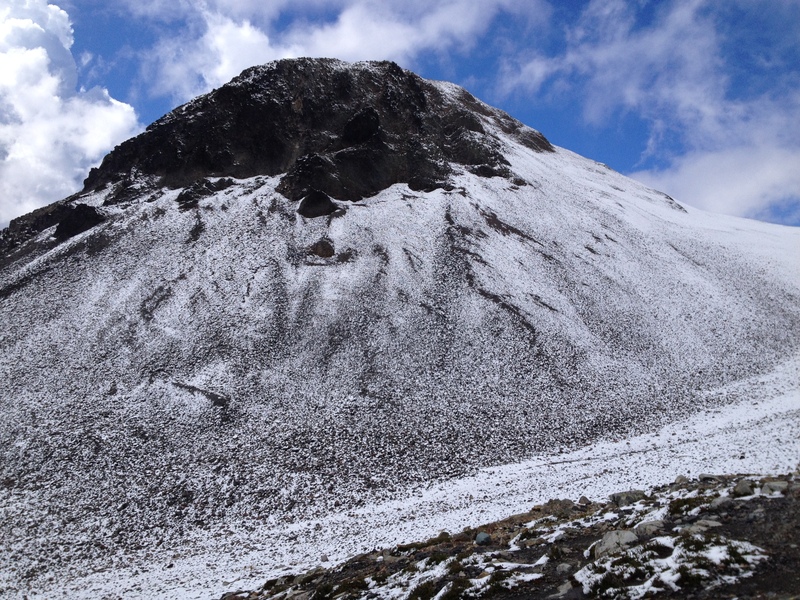 As we enjoyed our dehydrated meals we noticed that it was no longer raining – the rain had turned to ice and snow! While it was a beautiful sight, my husband and I knew we were in for a long, cold and wet night in the wilderness. I grabbed my camera and rushed outside to capture the beauty of the snow falling onto the lake. 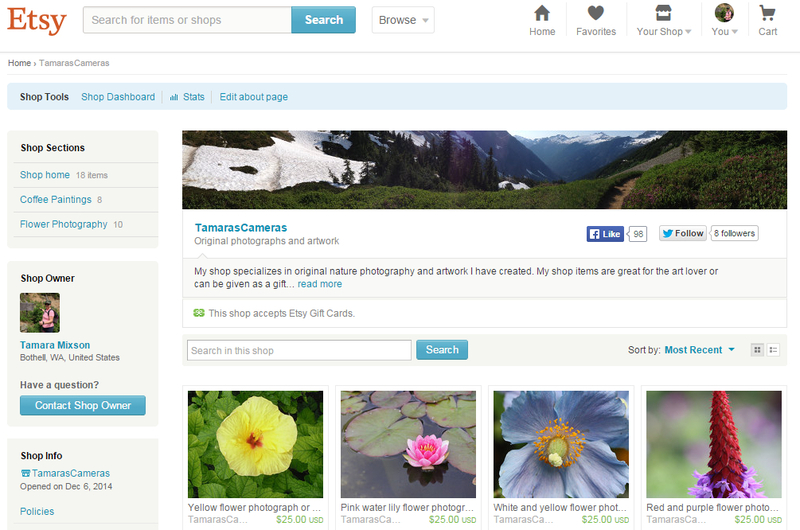 That was the moment I realized my second mistake – I didn’t put a memory card in my camera! I quickly snapped two photos with my iPhone 4s; therefore, all of the photos in this blog were taken with my cell phone. As we climbed into our tent before dark, I was thankful that we had invested in a larger backpacking tent earlier in the year. After having a mini breakdown about the freezing temperatures and the large rock strategically located just under my sleeping mat, I welcomed sleep even though it was still light outside. Wearing every layer of clothing I had packed, I crawled into my sleeping bag chilled to the bone. Needless to say, it was a long, cold night in the wilderness. The next morning began with a discussion on whether we could face another cold, sleepless night in the wilderness. The sun had finally forced its’ way out of the clouds and over the mountain peaks topped with fresh and snow. With our bodies finally warmed from hot coffee and breakfast, it was easier to make the decision to stick it out for one more night. The excitement of hiking to Black Tusk pushed the memories of the uncomfortable night to the backs of our minds. As we finished our breakfast, backpackers were pouring into the campground. Even though we had a rough night, it had allowed us to beat the crowds and secure a nice campsite. I’m certain the campground was full before noon. We packed our day pack and hit trail headed to Black Tusk. The views of the glacier peaked mountains that had been hidden the day before were now in plain site. The trails instantly begins to climb up and away from the lake towards Taylor Meadows. It slowly switches back and forth through the canopied forest. It wasn’t long until we reached the meadows. The trail flattened and the forest opened up to a mountain peaked background. Once we hiked through the meadows the trail came to a fork with trail marking sign and primitive facilities. As we took a quick break and chatted with a few hikers I noticed something moving in the distance – a black bear was slowly making its way across the meadows! 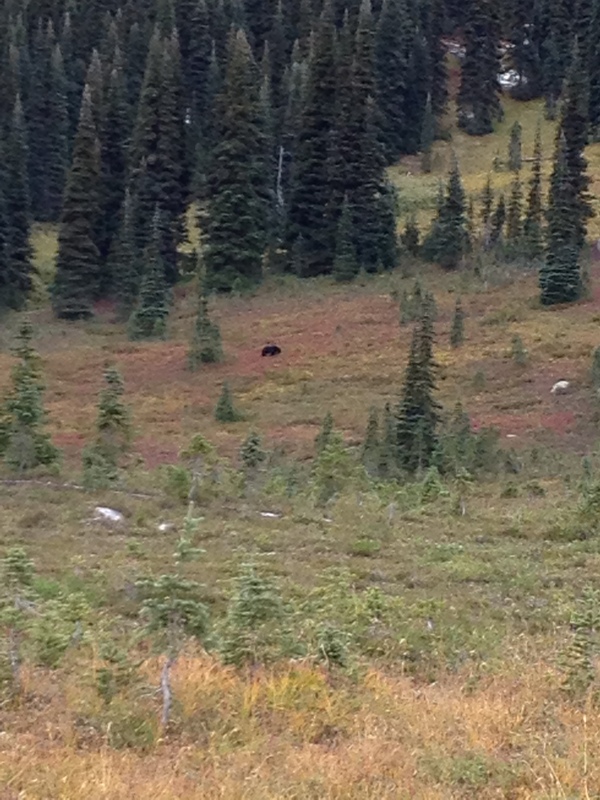 I pointed it out to the other hikers and we all enjoyed watching the bear in its natural environment. The chill in the air pushed us to hike on hoping to warm ourselves up. Once again the trail begins to climb upwards towards Black Tusk becoming slightly steeper at each switchback. It wasn’t long before the combination of the uphill hike and the sun breaking away from the clouds had us shedding our warmer layers and welcoming a lunch break. A large boulder field crossing the trail seemed to be a great spot to soak up the warm sun and refuel before the final push to the Black Tusk viewpoint. 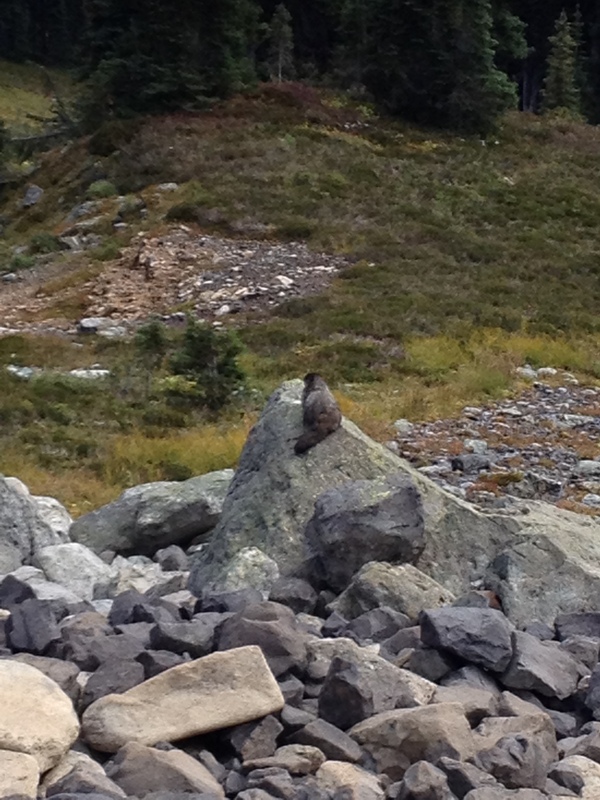 We enjoyed the company of curious marmots as we looked onto views of Garibaldi Lake surrounded by mountains. Once the clouds made their way back in front of the sun, it was time to hit the trail and make the final push to view Black Tusk. As we climbed higher snow was becoming more noticeable along the trailside. We made our way up the scree field and Black Tusk finally came into view. It had a fresh covering of snow and so did most of the area surrounding it. 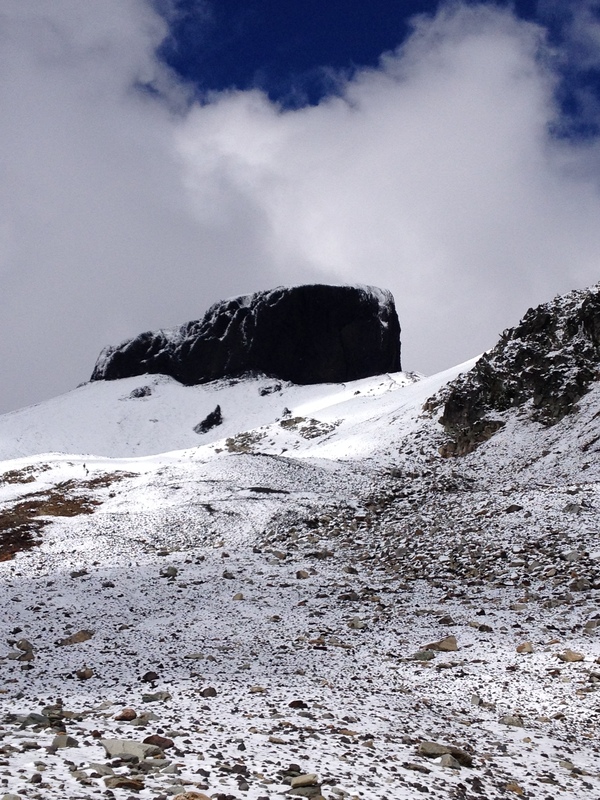 The clouds were were moving very quickly across the sky sometimes making Black Tusk disappear. 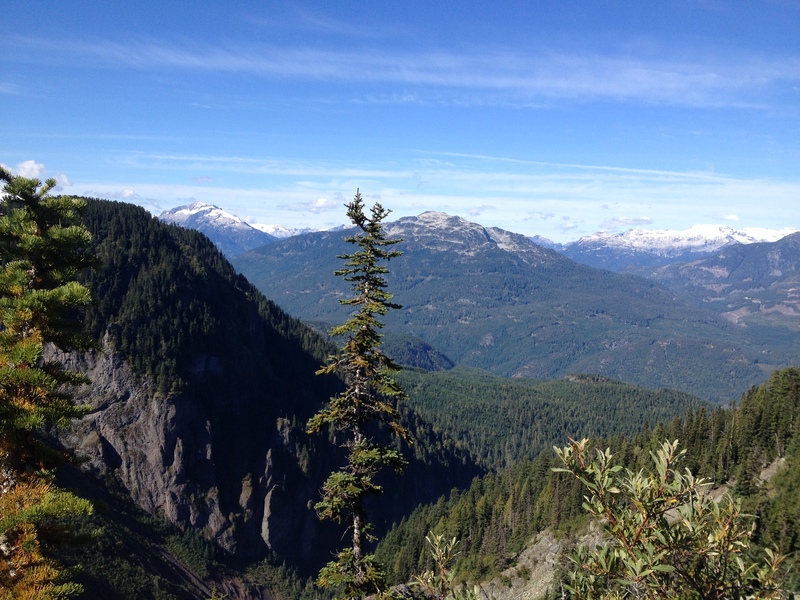 We reached the Black Tusk viewpoint with a sign warning us of the end of the maintained trail. I was happy to soak in the view on stable, snow-free ground as my husband made his way upwards towards Black Tusk following the footprints in the snow from previous adventurers. The 360° view was truly one of the most spectacular ones I have ever seen including Black Tusk, Panorama Ridge, and Garibaldi Lake. I spent my time alone enjoying the quiet solitude on what felt like the top of the world. I enjoyed photographing the surrounding mountains, ever changing from the constant movement of the clouds in the sky. My husband arrived back at the viewpoint just as I was saying farewell to a pair of hikers from The Netherlands heading up towards Black Tusk themselves. 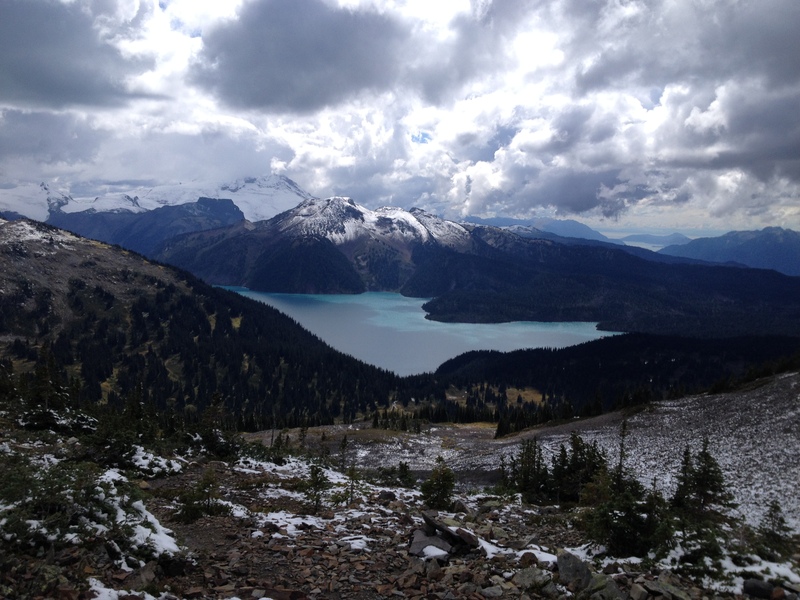 Our sore feet welcomed the downhill hike as we headed back towards our temporary home at Garibaldi Lake. It seemed like no time before we arrived back at the campground and we were happy to see the valley filled with sun. 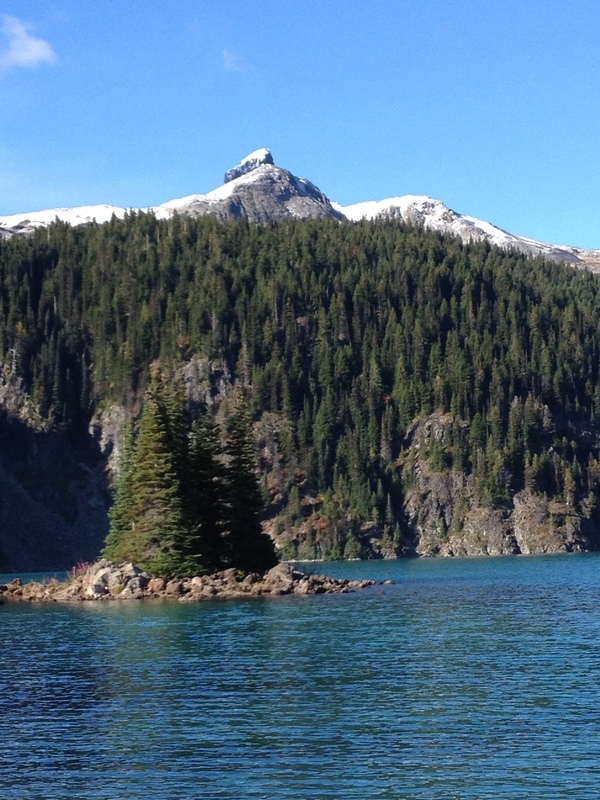 We spent the late afternoon exploring the tiny islands that speckled alongside the Garibaldi Lake shoreline. The area was packed with backpackers sharing stories of their day’s’ adventures. Most of them only arrived in the park that morning having missed the unpleasantness of the cold, rainy night before. As the sun began to dip behind the mountains to the west of the lake, it wasn’t long before the cold air settled into the valley once again. We headed to the warmth of the shelter ready to cook our dinner for the evening. Pushing our way through the crowds of people, we found a small corner of a picnic table available for us to use. It was interesting listening to the sound bites of the day’s events from the various campers. 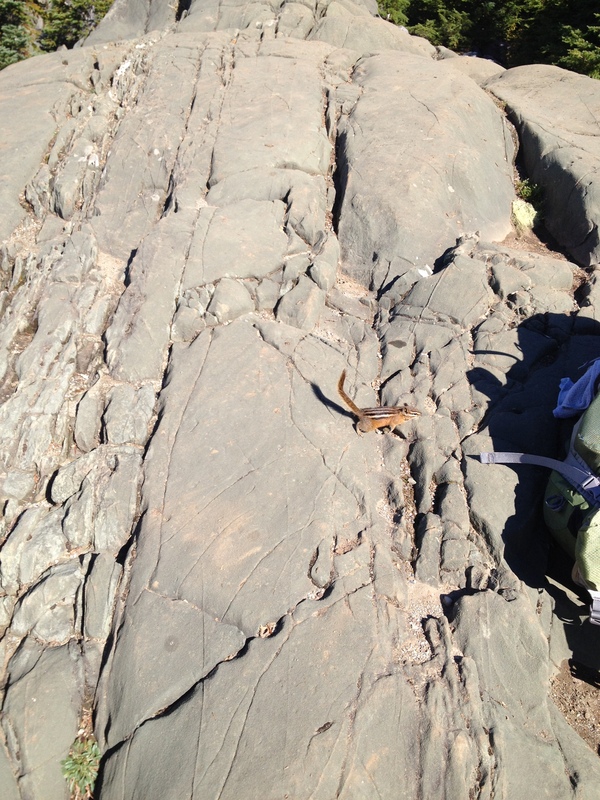 While we all had a different story to tell, we each shared a common bond in the adventure of backpacking. We headed to our tent exhausted from the day’s journey to Black Tusk, and slipped into our sleeping bags before the sun set for a second night. It was another very cold night in the wilderness. After two nights of what seemed to be sub freezing temperatures, we woke with the excitement of packing up and heading out of the wilderness. The packed shelter on the previous night gave us the idea to eat breakfast early in order to beat the crowds to the shelter. We were the second group to arrive at the shelter and as we prepped our meal for the morning while the shelter slowly filled to capacity. Just as we were about to leave the shelter, a young couple arrived describing a black bear that was hanging out on the trail towards Panorama Ridge. They were looking for a park ranger and excitingly explained how the bear would not leave the path of the trail leading the two back to the campground. We headed back to our campsite to prepare for our journey out of the park excited to think about what may cross our path along the way. We packed up our tent as another couple was patiently waiting to take our spot. It was difficult to leave the wilderness behind on such a beautiful, sunny day, but our bodies longed for a warm night in a comfortable bed. A world that was hidden from us by rain and clouds during the hike in was now fully exposed. The only thing pouring onto the trail this day was droves of backpackers and day hikers ready to enjoy the holiday weekend. 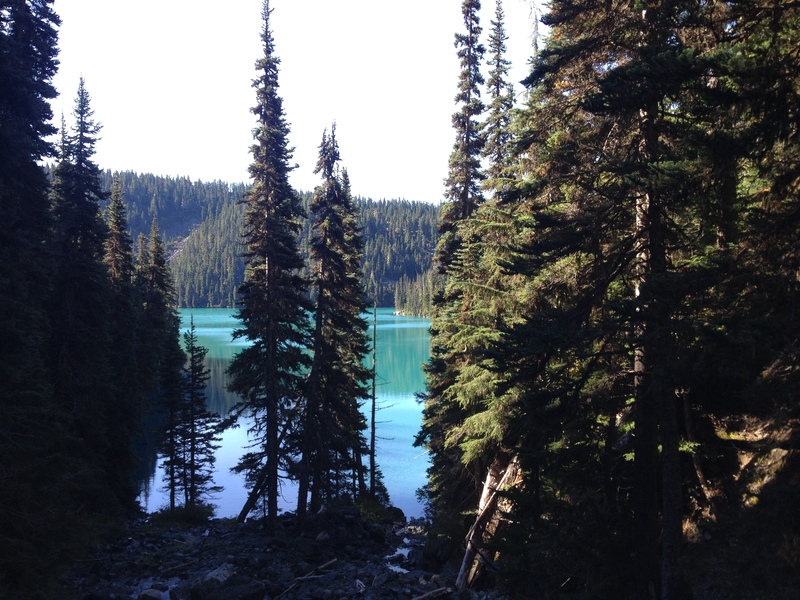 We passed by Lesser Garibaldi Lake and Barrier Lake this time seeing the deep aquamarine colors reflecting from their surfaces. At first we welcomed the downhill hike, but it wasn’t long before our muscles were sore and needed a break. A sign pointing towards a viewpoint for The Barrier seemed liked a place to stop for a picnic lunch. The sight was breathtaking as the forest opened up and the trail cliffed out at the edge of The Barrier viewpoint. It was hard to believe this view was blocked by clouds and rain only two days ago while now the sights were endless in every direction. As we soaked up the views and the warmth of the sun, very persistent ground squirrels and birds were trying to steal our food. It was easy to tell that the rules of No Trace Left Behind had been broken and these animals were used to being fed. At one point a small squirrel ran up my back attempting to reach the food in my hand! We were surrounded by hungry wildlife and decided it was time to make the final push towards the parking lot. The last few miles of downhill trekking were relentless. As we neared the parking lot with only a few switchbacks ahead of us a day hiker stopped to ask us how far the lake was. We laughed a little and explained they had a while to go before they arrived at their destination. Another hiker’s journey was just beginning as ours was just about to end. We arrived to a very full and crowded parking lot. As we drove down Daisy Lake Road towards the Sea to Sky Highway the side of the roadway was lined with cars for nearly a mile or more. We left the Canadian wilderness filled with warm hearts and a lifetime of memories. 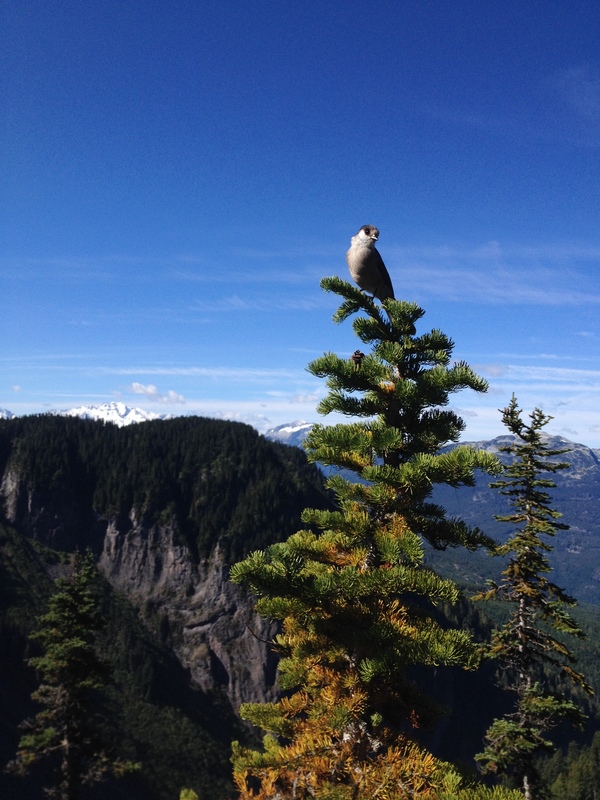 This entry was posted in Backpacking, Camping, Hiking, Nature, Panoramics, Photography, Travel and tagged backpacking, BC British Columbia Canada, Black Tusk, Garibaldi Lake, Garibaldi Provincial Park, nature photography, panoramics, tamarascameras. Bookmark the permalink.